A sixth of US workers in 2014 were born abroad, up from 11 percent when the data were first collected in 1996. The US labor force of 156 million includes 26 million workers born outside the US. Foreign-born workers over the past decade have had a lower unemployment rate than US born workers except for 2008-09. 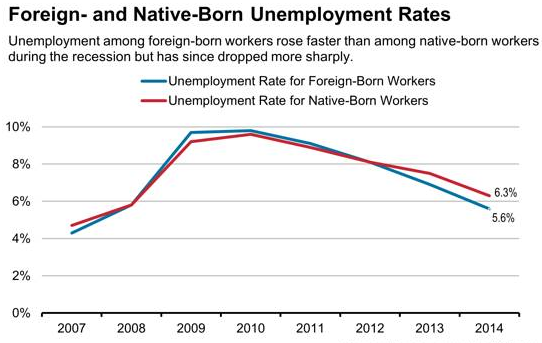 In recent years, the unemployment rate for the foreign born is significantly below the rate for the US-born.